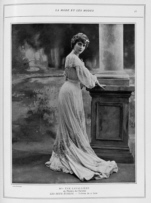 The following incident regards the conversion of the famous 19th century French actress *Eva Lavalliere (see her story below -ED). Here is the account of how she gave up cosmetics, which she realized are not pleasing to Our Lord. 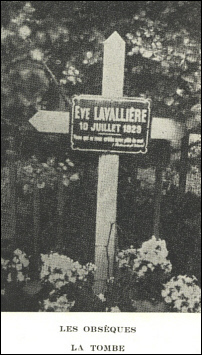 Not technically a convert, Eve Lavalliere (real name Eugénie-Marie-Pascaline-Fenoglio) was born into a violent family. Her alcoholic father eventually killed her mother and Eve herself escaped only narrowly. Gaining an entry into the world of the Parisian stage, Eve became very rich and completely abandoned herself to a debauched life. Her conversion came about through the influence of a country priest. Her popularity increased rather than waned with the years. Her wealth was enormous, both from her theatrical earnings and from her friends and admirers: She had a sumptuous flat in the Champs Elysees, decorated and furnished in the latest fashion which included concealed lighting—then practically unknown, and a room furnished in polished ebony with purple hangings. Eve hated the room and privately thought it hideous; but it was good publicity so it had to remain. To get away from it, she took another flat in Auteuil and spent most of her time there. Her days were crowded now with social functions in addition to her work at the theatre, for she was always in request and no fete was complete without her. "Do you suffer a lot?" "Have you any hope of being cured?" "None. But I am so happy! You cannot imagine how great my happiness is." "Even with so much suffering?" "Yes, and because of it. I am in God’s hands. Tell my friends of days gone by that you met the happiest person on earth." “I left everything for God; He alone is enough. Eternal rest grant to them, O Lord, and let perpetual light shine upon them. Amen. 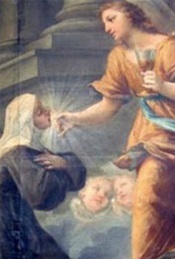 "Blessed Angela of Foligno had many difficulties to encounter after her conversion. The worldly life she had formerly led had taken such deep roots that it required great efforts on her part to destroy them. Satan not only suggested to her that she would not persevere in her conversion, but that it was foolish for her to impose such an impossible task on herself, for which she would be blamed by every sensible person. In the midst of this battle and anguish of soul she at once had recourse to God, begging of Him to come to her assistance. This is the first time I've heard of Eve Lavalliere, Catholic penitent, but I will begin to pray to her today. If any true Catholics have prayed to the Catholic penitent Eve Lavalliere and received special answers (perhaps miracles) to prayers directed specifically to her - please email TCW - who will forward documented information to proper Church Authority. Some face and anti-wrinkle creams have been using stem cells from aborted babies for many years now. Read your ingredient lists for COLLAGEN.